Home › Basketball Plays › "Fist-Down"
Home › Offenses › Zone Offenses › 2-3 Zone Offense › "Fist-Down"
Basketball Zone Play - Michigan State Tom Izzo's "Fist-Down"
This zone play has been used by Coach Izzo at Michigan State, and comes from his "Multi-Threat Scoring Offense" DVD. 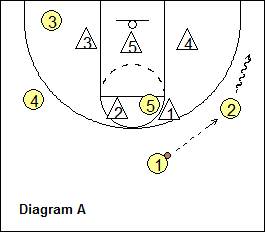 Coach Izzo has used this play successfully against the 2-3 zones of both Syracuse and Florida. He describes it as a strange play that works well against both the 2-3 and the 3-2 zone defenses, but not so well against the 1-3-1 zone. 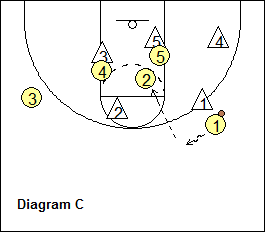 We start the offense vs the 2-3 zone as seen in diagram A. We place our best shooters, O2 on the right wing, and O3 at the left (weakside) short-corner. Our worst scorer is at the O5 spot at the high post, and O4 starts on the weakside, left wing. O1 passes to O2 and O2 dribbles toward the corner, and then passes back up to O1 who has replaced O2 on the wing. As O2 dribbles down, O5 screens the middle big defender X5, and O4 down-screens the weakside low defender X3 (diagram B), and O3 cuts out to the weakside (left) wing. 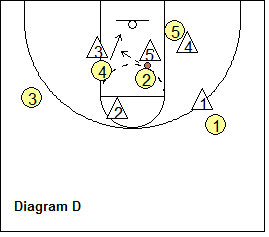 O2 passes back to O1 and cuts hard around O5's screen into the open spot in the middle of the paint. After receiving the pass from O2, O1 delays a second and then dribbles up for a good passing angle to make the pass to O2 inside (diagram C). O2 might have an open shot here. The diagrams below show several options. After screening, O5 posts up on the right side, but since he is not a great scorer, O5 is not a priority option, although could be open if X5 comes up to defend on O2. 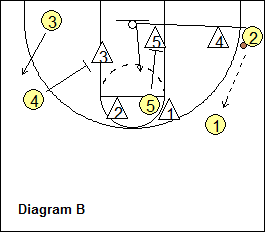 After screening, O4 cuts to the hoop and could get a quick bounce pass from O2 for a lay-up (diagram D). 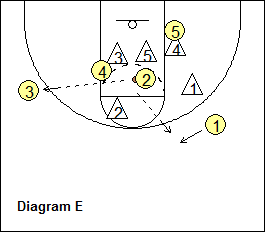 In diagram E, if O4 is not open (the X3 defender stays on O4), usually our shooter O3 is wide-open for a pass from O2, as the X2 defender will tend to collapse down toward O2 in the paint. Also notice that after passing in to O2, O1 re-locates to an open spot also, and could also get the pass from O2 for an open shot. Finally, O1 must not try to jam or force a pass into O2 if it looks too clogged up inside (diagram F). 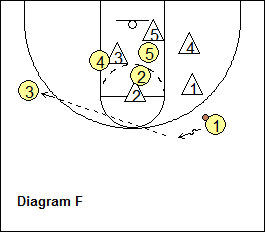 In this case, O3 will be open on the skip-pass (from O1) for a 3-point shot.